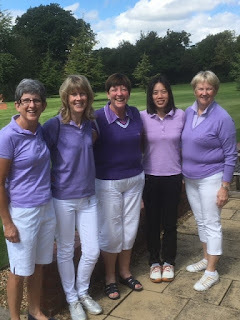 Match day No 5 for the Scratch Team was on Monday 4th July, away at Harpenden. When they came to Chesfield last month we beat them fair and square and so they were looking for a bit of revenge on home soil!! However, this was not to be and once again the girls from Chesfield read the greens, hit the fairways and came away with an excellent and closely fought win by 3 points to 2. Once again massive congratulations to our team, now FOUR wins from five! Next is away to Mid Herts on Sunday August 7th. Bring it on…. !